by wangdu on June 12, 2014 in Karmapa, Shrine Room Project, Website. Click on the image above to see more images. 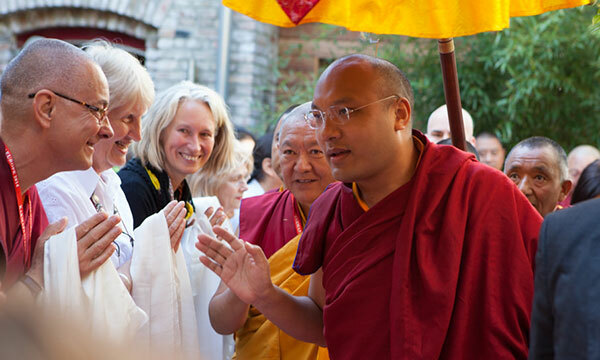 On the sunny morning of June 6, 2014 , the Karmapa and his entourage drove down Kinzigstrasse in the former East Berlin to pay a visit to the Bodhicarya center, founded by Ringu Tulku Rinpoche. The wood fence lining the street outside the center is decorated with colorful drawings of the eight auspicious symbols, which lead up to the main gate. Its doors are opened wide to reveal a vista of the countryside hidden in this corner of Berlin. Winding paths lined with grasses and flowers wend their way past red brick, single-story buildings to the tall meditation hall at the back of the property. On top are special rooms for the Karmapa including a balcony with a view of the gardens and the surrounding area. Ringu Tulku Rinpoche closed with a request for the Karmapa to bless and give them guidance, to really take over this place and make it useful for many people in the future. The monk Tenzin then read out a formal request to His Holiness, asking him “ to be the head of our center. Until we attain enlightenment, may we help you in the Buddha activity that you are predicted to perform for all the beings in the world.” Tenzin then offered the Karmapa a large, symbolic golden key to the center. See all the Karmapa Foundation Europe’s images (taken by our own Francois Henrard) here.